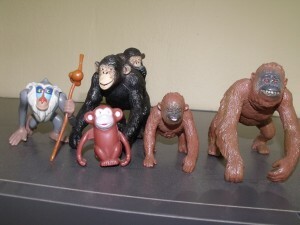 Evolutionary Tchotchkes as Objectified Cultural Capital | Welcome to the EvoS Consortium! I was recently skimming thru human behavioral ecologist Lee Cronk’s book That Complex Whole looking for a good definition of signaling theory (which I couldn’t find there but found in a recent Bulbulia & Sosis article). In rereading Lee’s intro, I saw that one of the things that, as a kid, attracted him to anthropology was all the cool tchotchkes a friend’s anthropologist father had laying around their house. How ignoble & facile, right? Oh please. Who doesn’t love cool toys & trinkets? In fact, a discussion of one’s collection of trinkets & toys falls right in step with signaling theory. What does it say that I, like Lee, am a huge admirer & envious of exotic-looking anthropological ephemera collections? When I enter my friend & colleague Keith Jacobi‘s galleries–er, offices & exclaim, “What big objectified cultural capital you have!”? Well, one, it says, yes, I am a total geek. Two, it says that I am signaling to other geeks that I am a total geek. Cultural capital is a Bourdieudian concept referring to non-financial stuff that can enhance social mobility. For instance, the social skills your parents or someone taught you, the college degree you might have earned, or the trinkets that suggest I’m interested in & know something about evolution are all potentially prestige-enhancing. What’s the evolutionary significance? Well, if I were a bowerbird, displaying novel & shiny cultural trinkets would be my way to woo a female geek bird to mate with me. Incidentally, when I did my wooing, I was working in the music industry, not anthropology. So what did I woo with? Mixed tapes. Sound familiar. High Fidelity, anyone? Uh huh, I thought so. Anyway, what occasions this post about tchotchkes is that hitching one’s wagon to a particular horse gets you identified with that horse, & people then think of you when they’re out & about & see affordable trinkets & toys that remind them of that horse. So I’ve accumulated a nice little collection of horse–er, evolution-oriented stuff that I want to show off. Today my good friends Steve Bunker & Barb Chatametikool & their kids brought me this awesome empty beer bottle! How cool is that? 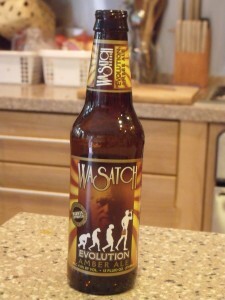 Actually, look really close at the label—it’s Wasatch Evolution Amber Ale, with Darwin on the label! Isn’t that awesome? They got it for me at Wasatch Brew Pub & Brewery in Park City, Utah on their annual drive from Alabama to Vancouver. Thanks, Bunker-Chats! 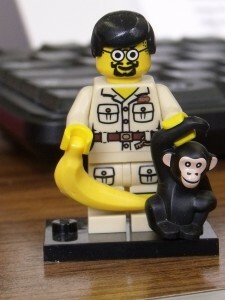 I had to take my glasses off so the monkey wouldn't grab them & had toned the mustaches down while doing fieldwork--otherwise, I look just like the LEGO-me! My friend Erik Porth, one of the grad students in our department, is really into LEGOs (sorry if I’m blowing your spot, Erik). And who doesn’t love LEGOs? I loved ’em as a kid, my kids love them (& are coveting the new Lord of the Rings editions!). In fact, I use LEGOs in my biological anthropology labs when I teach protein synthesis. I give each group a little kit. The instructions are the DNA, which are often esoteric pictographs that have to be turned into human language by a “transcriptionist,” which then have to be relayed to the technicians by a “translator.” The technicians are the “ribosomes,” who assemble carrier proteins (cars) or structural proteins (houses). Sometimes the transcriptionists & translators screw up, introducing mutations, though obviously these are not heritable. Sometimes we give them instructions with typos, which are mutations introduced elsewhere & are heritable, if we photocopy that same set of instructions from the next class. Anyway, in the course of developing this activity & consulting Erik on LEGO advice, he made this figure of me. 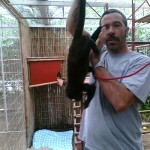 It’s awesome because it actually looks a lot like this photo of me taken in Costa Rica a few years ago holding a howler monkey by the tail. A few months after we officially inaugurated the EvoS program at UA, I got an email from Len Eisenberg, who runs the evolution-education website http://evogeneao.com/index.html. They have great resources for teachers there, including some awesome tchotchkes he sent me totally gratis. I got this fantastic wall poster of the Tree of Life in the pattern of peacock tail feathers & a box of assorted t-shirts to give as perks for signing up for the EvoS minor at UA. I am proud to say that I recruited enough students this year to give away all dozen of the shirts & wish I had another box! When I was hired, I inherited Jim Bindon‘s career-worth of PowerPoint slides (thank you Jesus–er, Jim…the beard is Jesus-like, though), tons of great books that make me look well-read & smart, & his monkey/ape toy collection. Blow up chimp from Jim Bindon. A perk is that my kids have toys to play with when they're in my office...if they can reach it. And it’s nice when friends Heidi Benstead go thrifting in the Bible belt & bring me little gems to help us teach the kids. I’ll have to take this one with me when I do the Anthropology course at the elementary school again this fall…to talk about how absurd it is. We had a great ALLELE lecture in 2011 by Mary Schweitzer, who grew up fundamentalist Christian but had her eyes forcibly opened because of her fascination with dinosaurs. 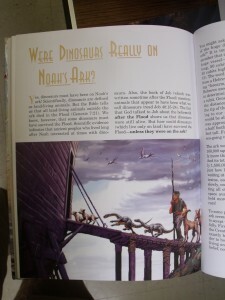 An adviser finally told her she just couldn’t hold to some of the wackier fundamentalist tenets about dinosaurs & seriously study them at the same time–the evidence supporting the time depth regarding dinosaur evolution is tremendous & the evidence supporting dinosaurs on Noah’s Ark–well, there isn’t any. But I digress. 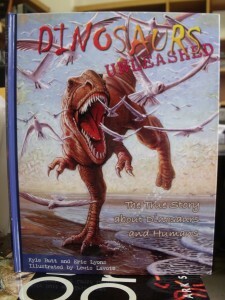 This book is still awesome. Finally (for now), I also buy stuff for myself when I simply must have it. 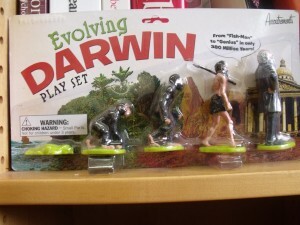 In “Junkman’s Daughter” in Atlanta I bought this fantastic toy set of the linear evolution icon. 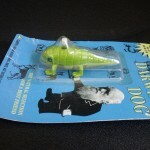 On a previous visit (I think), I also bought this wind-up Darwin fish. My kids are totally pissed that I never take these out of their packaging. They don’t get the cultural capital thing. Actually, I don’t think I get a lot of capital from this stuff anyway, but it’s still fun to be a geek & show it. So, if anyone is in Soho in New York City soon & stops by my favorite store, The Evolution Store, you know I will be happy with anything you get me! 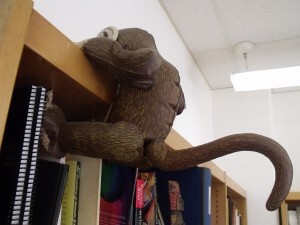 This entry was posted in Activities, Biological Anthropology, Primates and tagged Signaling theory, symbolic capital, tchotchkes, toys, trinkets. Bookmark the permalink.